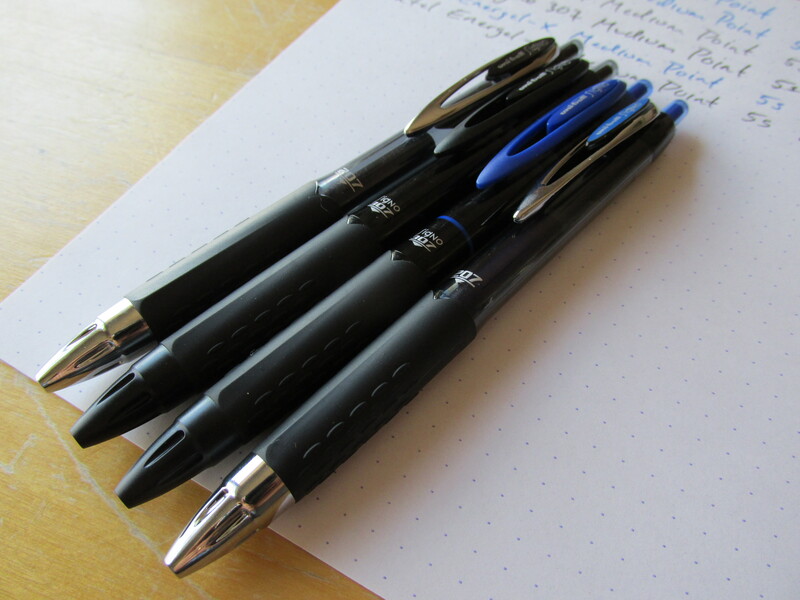 The Uni-ball Signo 207 is often touted as one of the better pens you can buy at the big box office supply stores or even your local grocery store. Although I have never formally reviewed the 207, I would generally agree that it is a solid buy. 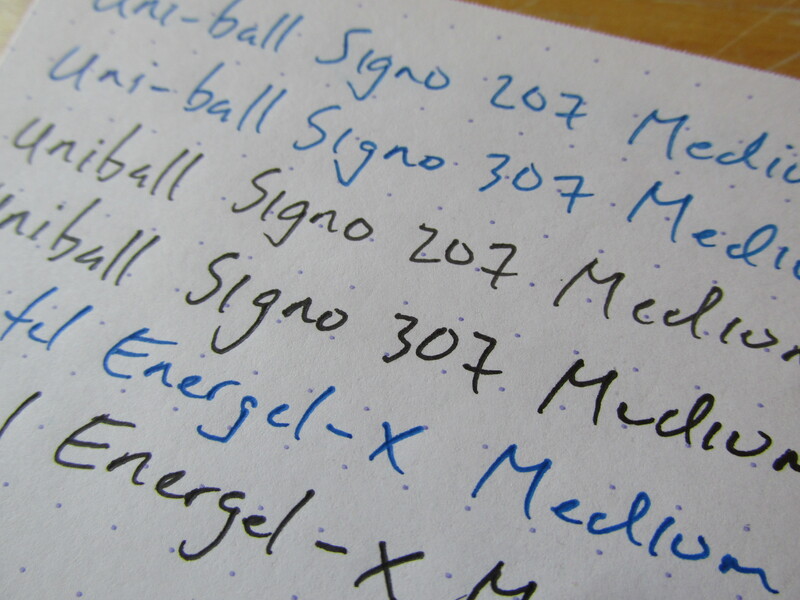 That said, the Uni-ball Signo 207 is not my readily-available gel pen of choice. 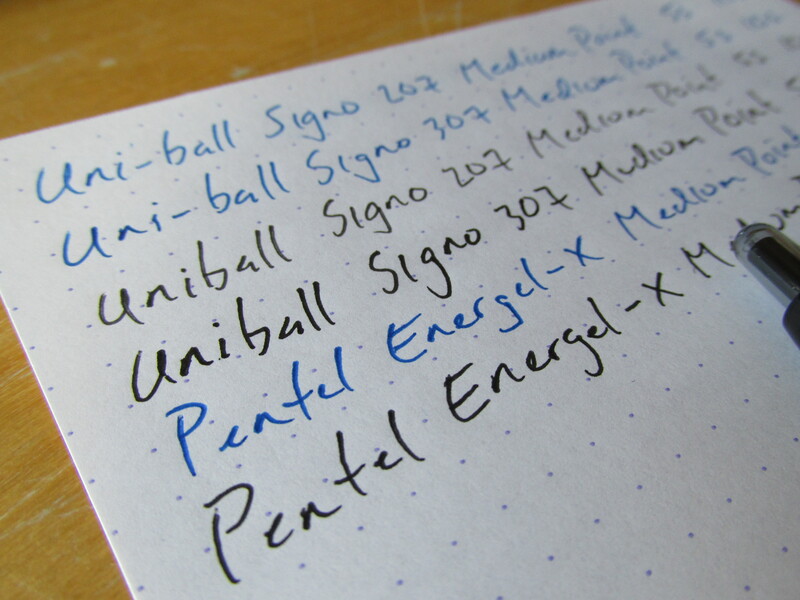 For me, that distinction goes to Pentel’s Energel. If you want a gel pen that writes consistently, smoothly (but not too slippery), offers bold colors and is fairly easy to find, you cannot do better than an Energel in my book. 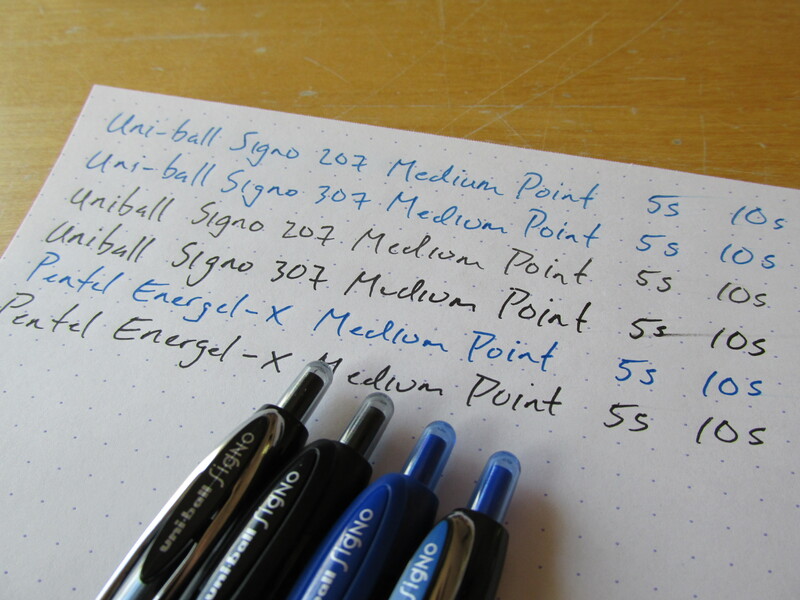 Could Uni-ball’s new entry into the gel pen world, the Signo 307, topple the Energel from its lofty perch? I came across the Signo 307 during a quick stop at Target. I went there looking for Cliff Bars, some things made by a company named Hanes (too much information?) and salsa. I left with Cliff Bars, Hanes products and the Signo 307s (they were out of the salsa I prefer). Like many of you, I wander into the stationery aisle of Target whenever I’m there. Of course, 99% of the time, there isn’t much new or interesting in the aisle but this recent trip was that rare 1% bonus. I have no idea how widely available Target is making the new Signo 307 so the experience at your local Target store may vary. By the way, they were running a sale on packs of Pentel Energel pens as well so you now have two excuses for a Target run. Compared to a medium point Signo 207, the medium Signo 307 clearly lays down a bolder line. While the 207 does not really skip, it will occasionally hesitate a bit when starting. In fairness to Uni-ball, most gel pens need a stroke or two to get going but the 307 seems less prone to this hesitation than most gel pens I’ve used. The 307 felt a bit smoother than the 207. The size, shape and feel of the 207 and 307 are identical. Cosmetically, the 307 swaps out the silver-colored trim of the 207 for matte black. The 307 barrel is also not as transparent as the 207 and features a fading checkered pattern on the body. Personal preferences are personal preferences. Me? I prefer the look of the 307. They’re both plastic pens but the 307 looks a bit more refined. The dry times of the two pens were pretty much the same. So, which do I prefer? I like the 307 a bit more. Will the Signo 307 replace the Pentel Energel as my “go to” gel pen? Nope. Ultimately, the Signo 307 does not do anything better than the Energel and the all but instantaneous dry time of the latter keeps it at the top of the podium for me. That said, I encourage you to check out the 307, especially if you like the 207 but would prefer a bolder line.